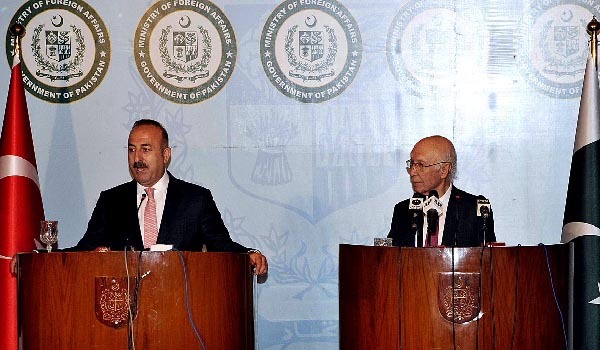 ISLAMABAD, Aug 2 (APP): Turkish Foreign Minister Mevlut Cavusoglu on Tuesday said Turkey in collaboration with Pakistan government was working over a solution to protect the students of Pak-Turk Schools in Pakistan and no adverse decision would be taken to affect their academic career. “Had both Turkey and Pakistan not been sensitive to students and their families, these schools would have been closed since December 2013,” the Turkish foreign minister said in a press conference when questioned about the fate of Gullen-sponsored schools in Pakistan, here at the Foreign Affairs Ministry. Turkey had declared Fetullah Gullen’s organization as terrorist entity following the July 15 unsuccessful coup. Aziz, the Turkish Foreign Minister expressed satisfaction that Pakistan was fully cooperating over the issue of Pak-Turk schools. However, Foreign Minister Cavusoglu pointed that there was a need to be “very careful” of the activities of these organizations, which he said could pose a threat to the security and stability of the host country. He said efforts were afoot to find out the arrangement for Pak-Turk Schools to continue their working in Pakistan. through dialogue and diplomacy, and not with war. He said Turkey being an active member of OIC Contact Group, had called upon the Secretary General to mobilize the group and also send a fact-finding mission to the valley to assess the situation. Advisor Sartaj Aziz and Turkish Foreign Minister Cavusoglu who earlier held a one-on-one and delegation-level meetings said their interaction focused on exchange of in-depth views on bilateral relations. Aziz said signing of Free Trade Agreement with Turkey expected in next few weeks would be a milestone to boost trade. He said the need for lasting political solution in Afghanistan also came under discussion. He said Pakistan and Turkey were host to largest refugee population in the world and expressed hope that the international community would be mindful of the burden. The Advisor expressed Pakistan’s unequivocal support to the dynamic leadership of Turkish President Recep Tayyip Erdogan and congratulated on the successful defeat of the military coup in his country. He mentioned that Turkish people coming out in streets in support of democracy was a sight to behold. Foreign Minister Mevlut Cavusoglu said Pakistan was the first country he was visiting after Turkey’s coup and acknowledged the support of Pakistani nation and government for their solidarity in this hour. He expressed gratitude to both Houses of the Pakistani parliament for adopting a unanimous resolution in favour of democracy in Turkey. He said that Turkey was taking all necessary measures against the perpetrators of coup. He dismissed the impression that Turkey would slide into a state of chaos following the state of emergency, adding that it was not meant to target public but the state structure to ensure stability in the country. The Turkish Foreign Minister said Pakistan was a second home to Turkish people and the two nations reciprocated feelings of affinity for each other. He underlined Turkey’s support to Pakistan against its fight against terrorism, mentioning that Turkey was also a victim of terrorism. He said Turkey was normalizing its relations with Russia and Israel.